I just returned from the 2018 Canadian Armed Forces Outlooks hosted by the Canadian Association of Defence and Security Industries (CADSI), held recently in Ottawa. This is CADSI’s second largest event after CANSEC. The buzz and excitement at this conference were indeed uplifting to see as the government unfolds its defence policy – Strong, Secure, Engaged. The sessions were interactive, and hearing updates about current and future requirements for the Canadian Armed Forces (CAF) will go a long way in moulding the content strategy for Vanguard over the next year or so. 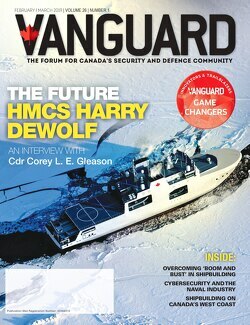 In this issue of Vanguard, we are excited to share stories on Army, Air Force and Navy, along with policy, cybersecurity, and deterrence. In his piece on the CF-18 replacement options, Chris Black, a former Air Cadet with 618 Queen City-based at HMCS York, provides a well-researched article comparing cost, capabilities and specifications of the options currently available to Canada for this upcoming program. He writes that Canada needs to select the best fighter aircraft available to defend itself from potential enemies. By doing so, we are sending a strong signal to hostile nations that Canada should not be taken lightly. We’ve put together the specifications for each fighter, which were compiled by Chris, to give you a comparative overview of the different capacities of each jet. Be sure to check this out in our Dashboard on pages 30-31. Pat Poitevin, from the Canadian Centre of Excellence for Anti-Corruption (CCEAC) at the University of Ottawa, shares an article on Anti-Bribery/Corruption (ABC). Even with the implementation of an ABC compliance program, Pat writes that this does not guarantee business success in bidding for a contract, but it does provide the foundation to prevent, mitigate and manage corruption-related risks. Modernized mobile bridge systems is a need for every army. In his piece, Marcello Sukhdeo, managing editor of Vanguard, writes about the capabilities of one company that could possibly fit the needs of the Canadian Army’s Bridge and Gap Crossing Modernization program. Read about trends in mobile bridge systems and what the CAF should be looking for in procuring such equipment. In her article, “eCrimes and Cyber Forensics,” Valarie Findlay, a research fellow for the Police Foundation (USA) and expert in cybersecurity and policing initiatives, writes about how cyber forensics is not a hot topic, but it should be. She talks about different concepts that can be employed to aid in the investigation of cybercrimes. In the Last Word, Eric Jacksch, a leading cybersecurity analyst with over 20 years of practical security experience, writes about multi-factor authentication (MFA). Despite the fact of the widespread availability of MFA applications, Eric points out that the vast majority of Internet-accessible systems continue to use simple username and password schemes, and many users fail to take advantage of MFA even when offered for free. 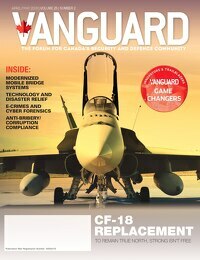 We are excited to announce our Game Changers for this issue: Geneviève Allard, Project Manager at OpDAQ Systems; Eric Fournier, Director General for IDEaS at National Defence; and Ken Peterman, President of Government Systems at Viasat Inc. Read about these leaders who are spearheading game-changing initiatives within the defence and security industry. I hope you enjoy reading this issue and look forward to seeing you at CANSEC.